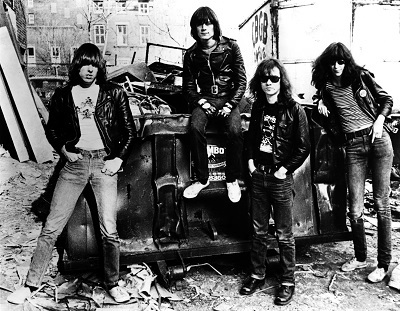 The GRAMMY Museum® in Los Angeles and the Queens Museum in New York have announced they are partnering to present an unprecedented two-part exhibition celebrating the lasting influence of punk rock progenitors the Ramones. Hey! Ho! Let’s Go: Ramones and the Birth of Punk will open on April 10, 2016, at the Queens Museum in New York. It then moves to Los Angeles on Sept. 16, 2016, where the second part will debut at the GRAMMY Museum in Los Angeles. The two-part exhibition, co-curated by the GRAMMY Museum at L.A. LIVE and the Queens Museum, in collaboration with Ramones Productions Inc., will commemorate the 40th anniversary of the release of the Ramones’ 1976 self-titled debut album and will explore the lasting influence the punk rockers had on their hometown, from their start in Queens to their history-making performances at CBGB. The exhibit will highlight their musical achievements, and place a special influence on the dynamic synergy between New York City’s music and visual arts scenes in the 1970s and 1980s. While the exhibition’s two parts will share many key objects drawn from more than 50 public and private collection across the world, each will explore the Ramones through a different lens: The Queens Museum iteration will begin with their roots in Queens and reveal their ascendancy in both music and visual culture, while the GRAMMY Museum version will contextualize the band in the larger pantheon of music history and pop culture. The vision of Queens Museum guest curator Marc H. Miller and GRAMMY Museum Executive Director Bob Santelli, the exhibition will be organized under a sequence of themes — places, events, songs, and artists —and include materials by figures such as Arturo Vega (who, along with the Ramones, designed their famed Ramones logo), Sergio Aragones (cartoonist for Mad magazine), John Holmstrom (Punk magazine founder and cartoonist), Shepard Fairey, and Yoshitomo Nara (who, for this exhibit, has created a large-scale version of one of his famous paintings of his recurring character Ramona, whom he named in homage to the Ramones). Also included in the exhibit are contributions from the personal collections of Mickey Leigh (Joey Ramone’s brother and Ramones’ original stage manager) and Linda Ramone (Johnny Ramone’s wife), as well as works from well-known rock photographers such as Roberta Bayley (who shot the first Ramones album cover) Bob Gruen, and David Godlis, along with Danny Fields (Ramones’ first manager), Monte Melnick (Ramones’ tour manager), and others who were intimately involved with the group throughout their career. Additional artifacts will also include personal memorabilia such as clothing and instruments. In the “post-pop” world of New York City in the 1970s and 1980s, music was largely looming with a new generation of artists taking up residency in the area’s lofts and tenements. Many formed or joined bands, while others, finding inspiration in Andy Warhol’s work with the Velvet Underground and the psychedelic posters and comic art in San Francisco, connected to music via commercial art and fine art formats. As central figures at New York’s CBGB, the Ramones served as both subject and inspiration for many visual artists, resulting in a large body of works, many of which will be featured in this exhibition. Hey! Ho! Let’s Go: Ramones and the Birth of Punk is organized by the GRAMMY Museum and Queens Museum, in collaboration with Ramones Productions Inc., JAM Inc., and Silent Partner. The exhibit is co-curated by Queens Museum guest curator Marc H. Miller and Bob Santelli, Executive Director of the GRAMMY Museum. The Ramones were loud and fast — and gloriously so, from the moment of their inception in Forest Hills, New York, in 1974, until their final concert, 2,263, in Los Angeles on Aug. 6, 1996. They were prolific — releasing 21 studio and live albums between 1976 and 1996 — and professional, typically cutting all of the basic tracks for one of those studio LPs in a matter of days. They were stubborn, a marvel of bulldog determination and cast-iron pride in a business greased by negotiation and compromise. And they were fun, rock & roll’s most reliable Great Night Out for nearly a quarter of a century, which seems like a weird thing to say about a bunch of guys for whom a show, in 1974 or ’75, could be six songs in a quarter of an hour. In their time, in their brilliantly specialized way, the Ramones — the founding four of Johnny (guitar), Joey (vocals), Tommy (drums), and Dee Dee (bass), were the sharpest band on the planet. Fully evolved as musicians and songwriters, they were confident in their power and the importance of what they had. Road to Ruin was the first album with a new drummer (Marky), followed by CJ (bass), and Richie (drums). The atomic-mono impact of Johnny’s Mosrite guitar, Joey’s commanding vocal delivery, the unity of wardrobe and identity, right down to the original, collective songwriting credits and the mutually assumed surname — were the result of a very simple philosophy. As Tommy put it: “Eliminate the unnecessary and focus on the substance.” That is precisely what the group did on every record they ever made, on every stage they ever played. The Ramones’ place in rock & roll history was already assured by 1978 with their first three albums: Ramones, Leave Home, and Rocket To Russia, all made in the span of 18 months, between February 1976 and the fall of ’77. When it was time to make records, Tommy said, “Our art was complete.” The art was the combined product of four strangely aligned personalities — all living within shouting distance of each other in the conservative, middleclass enclave of Forest Hills, where their mutual needs as fledgling musicians and bored delinquents far outweighed the mess of differences and civil wars that could never quite bust them apart. Once a Ramone, always a Ramone. Paying tribute to music’s rich cultural history, this one-of-a-kind, 21st-century museum explores and celebrates the enduring legacies of all forms of music, the creative process, the art and technology of the recording process, and the history of the premier recognition of excellence in recorded music — the GRAMMY Award. The GRAMMY Museum features 30,000 square feet of interactive and multimedia exhibits located within L.A. LIVE, the downtown Los Angeles sports, entertainment and residential district. Through thought-provoking and dynamic public and educational programs and exhibits, guests will experience music from a never-before-seen insider perspective that only the GRAMMY Museum can deliver. The Queens Museum is a local international art space in Flushing Meadows Corona Park with contemporary art, events and educational programs reflecting the diversity of Queens and New York City. The Museum presents the work of emerging and established artists, changing exhibitions that speak to contemporary urban issues, and projects that focus on the rich history of its site. In November 2013, the Museum opened its new space, a 105,000 square foot venue with a soaring sky lit atrium, suite of day lit galleries, 9 artist studios and flexible event space. The Museum seeks to exact positive change in surrounding communities through engagement initiatives ranging from the multilingual outreach and educational opportunities for adult immigrants, to the residency program, Corona Studio, which embeds artists in the local community. The Museum also conducts educational outreach tailored toward schoolchildren, teens, families, seniors as well as those individuals with physical and mental disabilities. The Queens Museum is located on property owned in full by the City of New York, and its operation is made possible in part by public funds provided though the New York City Department of Cultural Affairs.